One key to staying devoted to any type of dietary plan is to prevent a feeling of deprivation from occurring. If you have decided to adopt healthy eating habits, one of your goals is probably to omit sugary snacks from your diet. You may also want to discontinue eating most of the other unhealthy snacks you typically kept stashed in the pantry, your office drawer, backpack purse or elsewhere. The question then arises as to what you’re going to do when you get the urge to munch. Healthy veggie chips can become your new go-to snack item. Veggie chips can be an alternative to sweet treats that the whole family can enjoy. Kids may not even think of the chips as vegetables. 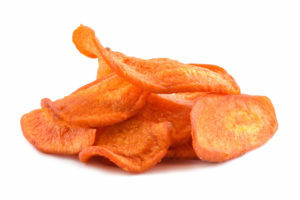 The color, crunch and general goodness of the chips may keep them totally distracted from the fact that they’re eating sweet potatoes, squash, carrots and green beans. By trading your mundane, not-so-healthy snack foods for healthy chips you get something colorful that may brighten your mood and something crispy to satisfy your craving for a crunchy snack. Beet chips and carrot chips are an ideal size for little fingers to pick up and for packing in snack bags. You can delight and impress your health-conscious friends by serving these chips at your next party. Adults can be just as guilty as kids when it comes to refusing to eat vegetables. However, when a vegetable is presented in a quirky form, there may be less resistance to exploring its flavor. Okra chips and green bean chips are excellent examples of uniquely-shaped healthy treats that make them too enticing to resist. The slightly nutty flavor of okra chips makes them an appealing snack. Slightly salty and mildly sweet green bean chips can be a satisfying alternative to your former less healthy sweet and salty treats. There’s nothing mundane about a healthy salad when it has garlic chips sprinkled on it. These flavorful chips add a burst of flavor to soups, stews, a stir-fry and vegetable side dishes. Add some of these chips to warm dishes such as fried rice, mashed potatoes and spaghetti or incorporate them into potato salad or pasta salad. There’s no rule that says you can’t simply enjoy these little chips as a snack. Mix them in with your veggie chips or trail mix to make snack time more exciting for your taste buds. Place a bowl of garlic chips on your party table and let your guest get creative with ways to enjoy them.